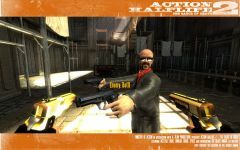 Action Half Life 2 is designed to simulate the experience of being in an Action movie. Movies like Hard Boiled, Face Off, and Die Hard are the inspiration for AHL. AHL2 is AHL reborn on Source engine. Post news Report RSS	Action Half-Life 2 Release! Yes.. it's release day... after several months of work we've finally reached our first release! The release is here!! Yes.. it's release day... after several months of work we've finally reached our first release! AHL2 In Your Face! Its been a lot of work and much effort has gone in from all involved... so well done guys! We made it! Since it's a first release, beta, etcetera etcetera, yada yada, you know this talk: It's by no means done, polished or complete. It's rough around the edges and in various other places, but so far we've been having a massive blast playing it, and we hope you will too. Download. Close the steam service, install, restart, and it should work by magic. Fun is mandatory, the rest is optional. So enjoy. Did you watch the whole thing? The rick roll was itself a rick roll. I believe the correct term is "Reverse rick rolled." In any case, I almost stopped the video as soon as I saw the rick roll thing, definately not a wise decision to make for advertising a mod! This was a joke for all the old AHL'ers really. The fact that they would never believe it. Advertising wasn't a major concern at that time. I'm wondering the same thing. Starting a video with a rickroll is a good way to say "lulz, this was all a big joke!" Too bad there are no maps. Only ****** hl2dm maps. We have a few old skool AHL mappers on the case (kidnapped, shackled and locked in a dark cellar). 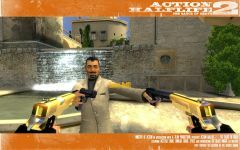 It's an action mod, just like it's predecessor: Action Halflife, and before that, Action Quake2. 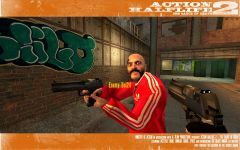 Isn't Action Quake2 predecessor of CS? Not really. The only member of the team that left to be part of the CS team was Gooseman. After that, the A-Team made AHL, which was about as succesfull as CS, before Valve broke the code with a patch. It took a year to rebuild the mod, and by then CS had a massive playerbase. Well, TS ( The Specialists ) is sort of successor to QuakeHL and ActionHL. Holy **** ! It's real !!! ?? No ? I download it now ! Wtf ? Rick Roll ! I hope this is the beginning of a number of incremental releases, because then I'm sure you'll make this as perfect as AHL was. Yes, this is only the start. There will be more releases (obviously), with new features, new maps, animations, etc. this mod is fantastic but why add rick roll in video? Apparently its the cool thing to do these days. This mod it's really fun lmao, i played a few matches, it's really fun ! LOL for a minute there I thought I'd been rick rolled. lol, nice intro -.-, otherwise great video, even though it looked pretty buggy, will try it out. The game seems pretty fun, but I keep getting a bug where I can't ever leave the spectator mode. I played on a couple of different servers, and it seems to happen randomly. I choose my weapons and hit "ok" but it keeps me in spectator..
You're playing in a Last Man Standing server where respawning only happens at the start of each round. Look for DM server in the browser instead. Actually this happened twice on a DM server.. This is a damn solid start! 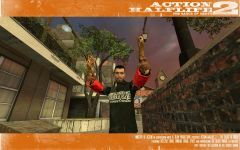 :-) My biggest complaint right now is the lack of feedback: it's tricky to tell if you're hitting someone with guns, and the first-person kung fu animations don't appear have any bearing at all on what you're actually doing! That might be, cos some of the models are just ported AHL1 models. Next release will have loads of new content. That was the lamest video i seen. untill it comes on. really awesome looking mod need to download this looks super fun to play. Wow, this was unexpected, cool. I will give it a try. Finally an over-the-top action-movie-style mod! We've been needing one. They all died off and were replaced with meh mods. Since a few servers use HL2DM's maps, I decided to copy HL2DM's maps, models, and textures to AHL2's directory. However, when I did that, I noticed that I could now use HL2DM's player models. So I used a Combine model, but, when connecting to a server, I become Jersey. How come? well you rickrolled me, therefore you lose my download. this is not some internet chatroom full of trolls this is serious stuff and while its ok to rickroll in certain places, this isn't an exception, take it off or become a joke mod. Lol, if you can't take a joke, then you shouldn't play games. This mod is here to stay, and tbh, i couldn't care less if you play or not. Oh my god, a joke!!! How dare you!! !